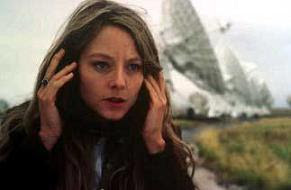 I greatly enjoyed the scenes from the movie “Contact” where Jodie Foster’s character Dr. Ellie Arroway was out sitting on the hood of her car near a giant radio telescope listening for signals from space. The scenes were shot at an actual radio telescope facility, the Very Large Array (VLA) located in Socorro, New Mexico. The powerful image of a researcher intimately devoted to scientific discovery gave me a warm feeling about the fact that a real-life organization like Search for Extraterrestrial Intelligence (SETI) is diligently attempting to discover life beyond our planet. As much exhilaration as a movie can engender it is nothing compared to the reality of what SETI actually does. SETI continues today, its search that began in 1960. Although no detection of an alien civilization has been made, there is much more of the sky to search at many more possible frequencies. Why there has been no signal detected is anyone's guess. It could be the radio silence found thus far is a function of SETI's limited search band, or the assumptions of the landmark Drake equation may be faulty, or maybe we just need to put more resources into the search. The SETI project is employing two exciting new areas of technology to further the scope of the search. First, the Allen Telescope Array (ATA) is the latest technology being offered for use by the SETI organization through a generous donation of $30 million by Microsoft co-founder Paul Allen. ATA is comprised of 42 telescope dishes at a desolate location in Hat Creek, Calif. A total of 350 dishes are planned, but additional funding is needed to realize this goal. Current SETI is scanning the heavens at frequencies around 1,420 Mhz which is the frequency at which hydrogen emits electromagnetic waves. It is thought that this is the most likely frequency an alien civilization might use to transmit signals. ATA, however, will scan a much broader range, from 500 MHz to 11.2 GHz, a range of 10 billion channels. The second new technology is the Lick Observatory Optical SETI Project which can detect very brief optical flashes from cosmic objects and technologies. This telescope will be located in the Cagnegie dome at the Lick Observatory and initially will consist of an ensemble of 7 Meade 16” LX200-ACF telescopes working in tandem. This is the first attempt at using the optical spectrum in the search for signals from alien civilizations. The SETI Institute is located in Mountain View, Calif., and has involved many high-profile supporters and luminaries such as the late Carl Sagan, Intel founder Gordon Moore, Frank Drake, Manhattan Project physicist Philip Morrison, senior astronomer Seth Shostak, and many more. Dr. Jill Tarter, director of SETI’s research department, was the model for the Ellie Arroway character in the 1997 movie “Contact.” The SETI Institute is a nonprofit corporation that depends on sponsorship by a number of different organizations such as NASA and JPL, as well as donations from the public. SETI has an excellent “Adopt a Scientist” fund raising program that is described in detail on their website. This Physics Groupie has been a SETI member for many years and participates in the search by running the SETI@Home screensaver 24/7, just to do my part. SETI is one organization that needs all our support. Please consider joining up to be part of something that may change humankind’s path forever. This was my favorit movie too! but I didn't know it was for seti. So Cool . . . thnk u.